Please complete the membership form below and then proceed to PayPal for payment. Must present card to redeem offers. x2 Adults / x2 children U16. 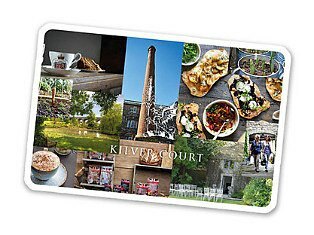 Friends of Kilver Court membership is valid for one year from date issued (as identified on membership card and Kilver Court records). Free garden entry is valid everyday that Kilver Court is open, excludes Christmas Day and New Years Day. In the event of adverse weather conditions or flooding, the gardens may be closed without prior warning. No refund will be available in the event that a cardholder cannot gain access to the garden. All partner attractions have agreed benefits but reserve the right to withdraw, change or amend this offer at any time. Kilver Court will not offer a refund in the event that an offer is withdrawn. An additional 10% off Sharpham Park products cannot be used in conjunction with any other offer or promotion. Items non exchangeable. Free tea or coffee offer is available seven days a week, with one drink free to card holders each month. English breakfast tea or americano coffee. Kilver Court reserves the right to amend or withdraw any Friends of Kilver Court benefits, without prior warning.